Does the world need another artist? Another Painting Party and suddenly there are six more artists in the world that were not there before. 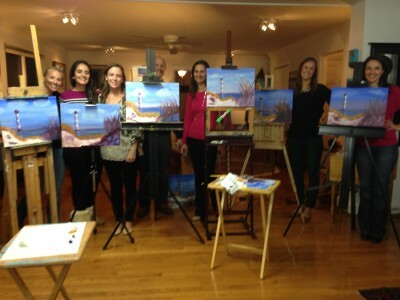 I love that none of these ladies has ever painted in oil before last night. A couple had done a Palette and Brush event but had no idea they could produce something they’d actually want to hang in their home or give as a gift this holiday season. My answer was a resounding “Yes!” Why, because that would mean six more people would be connecting to others through their creativity, making the world a little better place to live. Look for Amazon Local deal where you can sign up for Brush with Wine Events and Painting Master Classes launching on Black Friday. What a great gift! Pam Montgomery liked this on Facebook. David Hertzberg liked this on Facebook. Oh look another Rob sighting among a group of lovely women… you call that work? I so enjoyed assisting you last night. I could not help but be impressed by the work these women did. and also could not believe how critical and hard on themselves they were. Every one of them turned out very good paintings; but it seemed that none of them were pleased with their own work. Kudos to them for being brave enough to be beginners! It’s amazing to watch what happens to people confronting a blank canvas with paint. It can really trigger the ego, as we all know too well. It is impossible to have too many artists in the world. Fredric DeJaco liked this on Facebook. Donna Gill Colestock liked this on Facebook. Daniel Buchowski liked this on Facebook.